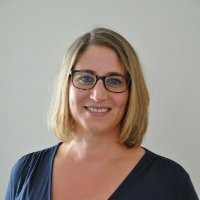 The family-owned company, St-Luc Labels & Packaging has over 200 employees, 3 plants in 3 countries (Belgium, the Netherlands and France), and 25 presses (6 flexo, 12 digital, 5 letterpress, and 2 offset). For over 25 years, St-Luc has focused on the production of a variety of packaging products, such as self-adhesive labels, shrink sleeves, folding carton and flexible packaging. Recently St. Luc faced UV Spitting, a common issue in the Label flexoprinting industry. A recent challenge faced by St-Luc was UV ink spitting issues from conventional anilox rolls on their flexo presses. Considerable production hours were lost in switching anilox rolls in an attempt to eliminate the problem. 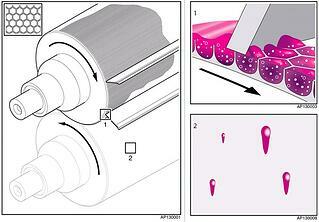 Image: at the position of the doctor blade there is pressure built up in the anilox cell. As the roll passes, the ink build up at the back of the doctor blade. After a while the ink build up is so big that it drops from the doctor blade onto the print plate or substrate, that is called Spitting. The solution that finally resolved the spitting issues, literally overnight, was Apex GTT laser engraved anilox rolls. St-Luc began with a trial on one of their presses, and after good results of consistent HD Flexo print quality and gain in production time, the decision was made to convert all flexo presses to the Apex GTT-technology. Image: At the position of the doctor blade there is no pressure built up because the ink can move through the open channels. No ink builds up onto the back of the doctor blade. 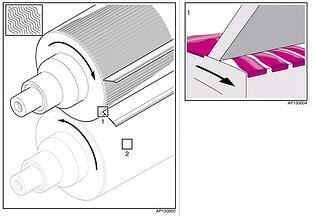 Because no ink builds up, no ink drops from the doctor blade onto the print plate or the substrate. No spitting! What is the GTT anilox difference? It ensures high repeatability in manufacturing – from roll to roll, month after month. GTT significantly reduces cliché wear. And it provides a better controlled print performance and guarantees print consistency for over 100,000 meters. GTT is the ultimate technology to be used in HD Flexo and Fixed palette printing from four up to seven colors, because of its consistency througout the lifetime of the roll. Ask your local Apex anilox sales rep for advice if you suffer from UV spitting as well.